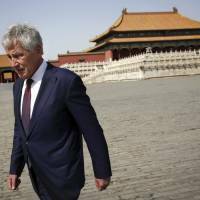 BEIJING - In one of the many frank exchanges U.S. Defense Secretary Chuck Hagel had in China this week, Gen. Fan Changlong told him how one of his uncles died as a slave in a Japanese mine during World War II. Fan, deputy head of China’s powerful Central Military Commission, spoke about the lessons of history, signaling Beijing’s concern that the U.S. is siding with Japan against China. Hagel replied by saying his own father had helped fight Japanese forces during the war. “The secretary made it very clear that we should be informed by history but not driven by it,” a U.S. official said in recounting Tuesday’s conversation, which he described as terse. The exchange sums up the frustration in China over the U.S. role in Asia. In the eyes of Beijing, Washington is increasingly supporting Japan and other countries over territorial disputes with China. The U.S. has said it is not taking sides but stands ready to defend its allies. China, some experts said, appears to be getting anxious that recent tough talk from American officials over disputed territories in the East and South China seas could be a preview of what President Barack Obama will say when he visits Asia this month. Dispensing with diplomatic protocol, China made clear this week that it does not want Obama jumping in with both feet when he travels to Japan, the Philippines and Malaysia — all vital U.S. allies. While Beijing has territorial disputes with all three, its ties with Japan and the Philippines are especially poor. Obama will also visit South Korea, with which Beijing is enjoying warm relations. China is at loggerheads with Japan in the East China Sea over the Senkaku islets, which are administered by Tokyo. China meanwhile claims most of the South China Sea and various isles also contested by the Philippines, Malaysia, Vietnam, Brunei and Taiwan. An Obama administration official acknowledged to reporters traveling with Hagel that Beijing’s tone was sharper on issues surrounding the South and East China seas than during the last visit by a U.S. defense secretary to China, by Leon Panetta in 2012. On Tuesday, Defense Minister Chang Wanquan told Hagel that Washington should restrain Japan, and chided the Philippines. 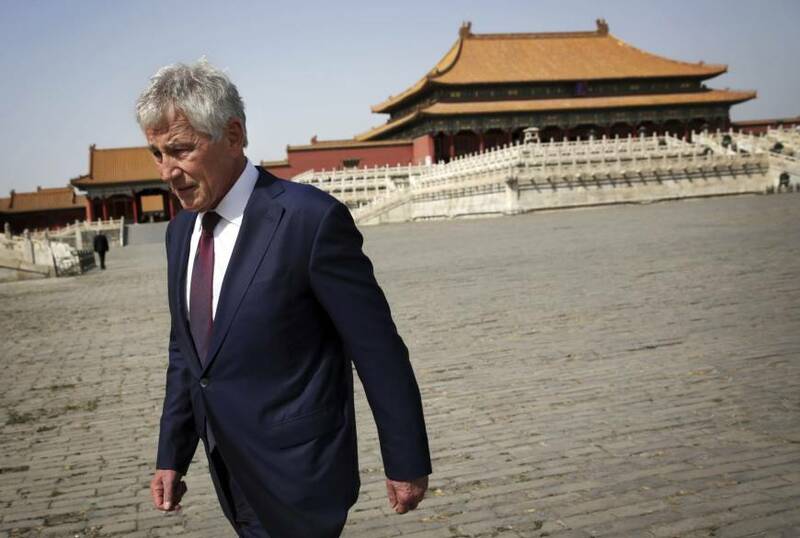 Fan told Hagel outright that the “Chinese people are dissatisfied” with U.S. support for Japan and other Asian nations, according to a statement carried on the ministry’s website. China’s ties with Japan have long been poisoned by what Beijing sees as Tokyo’s failure to atone for its occupation of parts of China before and during World War II. Japan’s repeated official apologies for wartime suffering are sometimes undercut by contradictory comments by conservative politicians. For its part, China has alarmed the region — and Washington — with its increasingly tough line on territorial disputes. It announced its biggest rise in military spending in three years last month, a signal from President Xi Jinping that China is not about to back away from its growing assertiveness. Beijing is creating a modern force that is projecting power not only across the East and South China seas, but farther into the western Pacific and Indian Oceans. Jia Qingguo, an associate dean of the School of International Studies at Peking University who has advised the government on diplomatic issues, said the last thing Beijing wants is for Obama to round on China during his Asia tour. “They (Chinese leaders) hope that the Obama visit will not be used to rally other countries against China. If you listen to the harsh rhetoric of senior (U.S.) administration officials, this is a genuine concern,” Jia said. Much of the tough comments from U.S. officials have come since China announced the creation of a controversial new air defense identification zone in the East China Sea that covers the Senkakus. “They (Chinese officials) are trying to figure out whether it’s the lower-level (American) people coming out and making these comments so the boss doesn’t have to, or whether it’s moving to a crescendo,” said Christopher Johnson, a former senior China analyst at the CIA and now at the Center for Strategic and International Studies in Washington.